The unemployment rate is at its lowest level in more than 48 years. The Bureau of Labor Statistics reported the economy added 223,000 jobs in May. With upward revisions to the data from the prior two months, this brought the three-month average gain to 179,000. The job growth also pushed down the unemployment rate to 3.8 percent, tying a low hit in 2000 (the next previous low is December 1969). The unemployment rate for blacks fell to 5.9 percent, an all-time low. The drop in unemployment was most notable for black women 20 years and older, falling 0.4 percentage points to 4.7 percent, and for black teens, with a reported 9.2 percentage point drop to 19.8 percent. Both are record lows. The other data in the household survey were overwhelmingly positive. While the overall employment-to-population ratio (EPOP) ticked up 0.1 percentage points to 60.4 percent, tying its high for the recovery, the prime-age (ages 25 to 54) ratio was unchanged. Nonetheless, the prime-age EPOP for both men and women remain at near recovery highs, 1.0 percentage points above the year-ago level for men and 0.6 percentage points higher for women. The biggest gains have been among the 25 to 34 cohort. The EPOP for men in this age group has risen by 1.4 percentage points over the last year and for women by 1.1 percentage points. By education level, the less-educated continue to have the biggest gains. The unemployment rate for workers with less than high school degrees fell by 0.5 percentage points and those with just high school degrees fell by 0.4 percentage points, while workers with college degrees saw a fall of 0.1 percentage points. The unemployment rate for all three categories of workers with less than a college degree is down by 0.8 percentage points from year-ago levels, compared with 0.3 percentage points for workers with college degrees. The unemployment rate for college-educated workers is still 0.2 percentage points above its prerecession levels. The unemployment rate for less-educated workers is below the prerecession lows. Other data in the household survey were also positive. The number of involuntary part-time workers dipped modestly, all the duration measures of unemployment fell, and the share of unemployment due to voluntary quits hit a new high for the recovery. At 13.8 percent, it is higher than the prerecession level, although still below the peaks hit in 1999 and 2000. The story on the establishment side is somewhat more mixed. While the overall job growth number is strong, it is striking that we are seeing no evidence of accelerating wage growth. The year-over-year increase in the average hourly wage was just 2.7 percent. If we take the average wage for the last three months (March, April, and May) and compare it with the prior three months (December, January, and February), the annual rate of wage growth has actually slowed slightly to 2.4 percent. The trend in hours is also not consistent with a tight labor market. 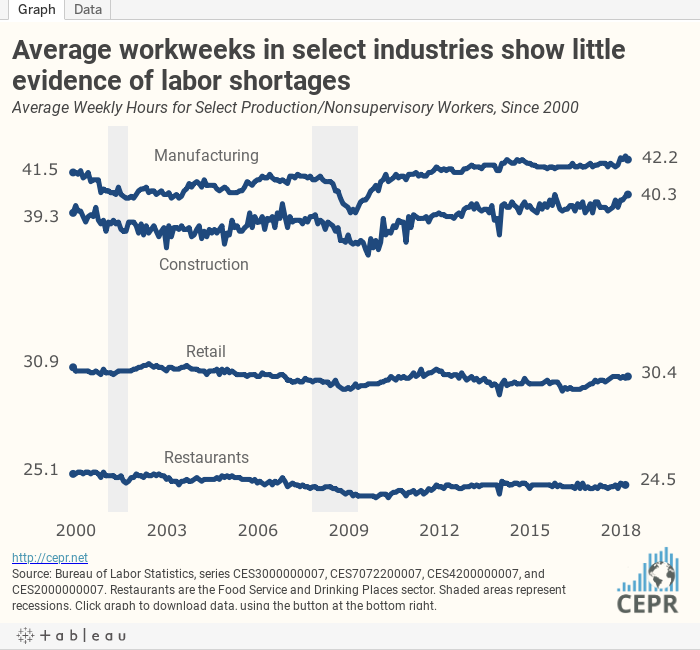 While we might expect that employers having trouble finding new workers would try to get more hours out of their existing workforce, there was no change in the average workweek last month, and it is just 0.1 hours higher than its year-ago level. It actually fell by 0.2 hours in manufacturing. The job gains in May were widely spread across sectors. Construction had another solid month, adding 25,000 jobs, putting it 286,000 above its year-ago level. Retail was also a big gainer, adding 31,100 jobs, putting employment 25,100 above year-ago level. Health care added 28,900 jobs, almost exactly in line with its average of 26,500 jobs over the last year. Restaurants added 17,600 jobs, in line with its average of 18,000 over the year. Manufacturing added just 18,000 jobs in May, its weakest month since last September when it added 6,000 jobs. With the reduction in the length of the workweek, the index of aggregate hours actually fell by 0.3 percentage points. The rising trade deficit may be leading to slower job growth in the sector. On the whole this an overwhelmingly positive report. The unemployment rate is now well below where the vast majority of economists put the non-accelerating inflation rate of unemployment (NAIRU), the effective measure of full employment, just a few years ago. The beneficiaries of this drop have been overwhelming disadvantaged minorities and less-educated workers. The one major negative is that we still see little evidence of the accelerating wage growth that we would expect in a tight labor market.